On “Vatos,” The Walking Dead continued its great pacing, picking up where it left off last week and making the season feel like one giant movie. I originally couldn’t understand why Merle had chosen to saw off his hand. 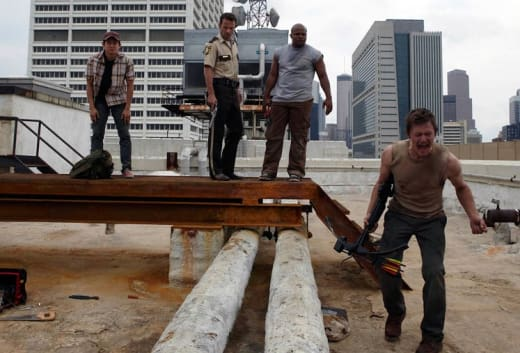 However, Daryl’s casual comment about the saw being too dull to get through the handcuffs cleared this up. It also didn’t come across as a forced explanation, but rather his out-loud attempt to comprehend what had happened. As the group followed the clues of blood, the second part of their mission came into play. Glenn strategically mapped out a way to retrieve the bag of guns, but, of course, nothing ever goes according to plan. At least Glenn was able to snag Rick’s hat. This second group of survivors was great extra tension for Rick and his crew. People are just as big of a problem, if not more, than the roaming zombies. They appeared like a rough and dangerous gang and I was ready for Rick to to fight them if they refused to give back Glenn. It was when the two groups faced off, that Rick was able to shine as a leader. 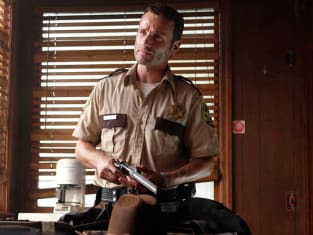 He not only was continuing to follow his word on finding Merle, but he was also repaying a debt to Glenn. Even staring down multiple cocked guns couldn’t sway his focus or determination to help those in need. I was pleasantly surprised by the truth behind the second group. Guillermo was simply playing the role of protective leader. 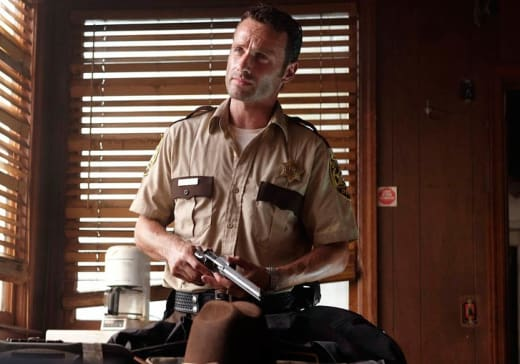 He needed to defend his people and standing up to Rick was an understandable choice. Sure, everyone has a past. However, what is truly important is the way people choose to deal with the present. The conversation between Rick and Guillermo illustrated this significance and showed the importance of a person’s character. Guillermo had never asked to be looked upon as a leader, but he chose to take it on anyway. He might have only been a custodian, but now he is a leader of a group of people hoping to survive. Rick respected and understood exactly how Guillermo felt. Characters like Glenn, who used to be a pizza boy, have adapted to the apocalyptic situation. He now utilizes his smarts and skills for his survival and fending off the zombies. However, someone like Jim couldn’t handle the memory of his family being eaten by zombies. He had a breakdown because he couldn’t deal with the current situation. Luckily, the group was there and helped him understand the importance of working together and focusing on the now. Unfortunately, the zombies don’t care about your past or role in the present. The final minutes were a fantastic conclusion to the episode. The multitudes of zombies that invaded the camp were not only a surprise, but also a scary and claustrophobic moment for the survivors. They seemed to be everywhere at once. I had thought that Amy was certainly a character that would be around for some time, especially as a contrast to her sister. Nope. The “Walkers” eagerly jumped upon her and began feasting. No one is safe from death on this show. The Walking Dead is proving its worth on television and I’m eager to see what happens next for the survivors, now that their camp has been overrun with zombies. Also, Merle is certain to appear at an inopportune moment to extract his revenge. Only two more first season episodes to find out what goes down!